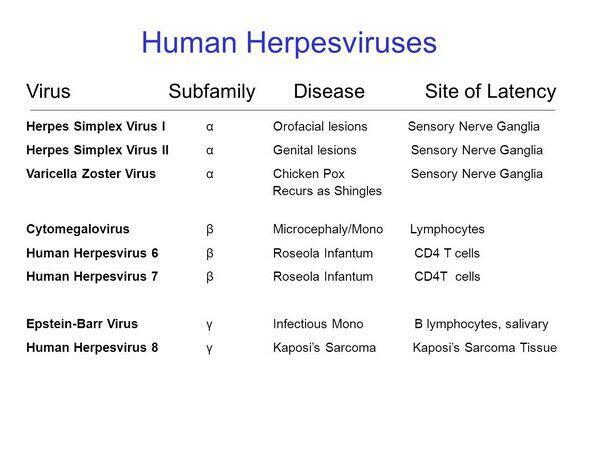 All herpesviruses are morphologically similar with an overall diameter of 180-200 nm. The nucleic acid core is ~ 30-45 nm in diameter, surrounded by an icosahedral capsid. The capsid is covered by a tegument and a lipoprotein envelope derived from the nuclear membrane of the infected host cell. The envelope contains at least nine glycoproteins that protrude beyond it as spikelike structures, while the tegument is a protein-filled area between the capsid and the envelope. Despite the morphologic similarity between these agents, substantial differences in the molecular composition of their genomes are reflected in their structural glycoproteins and polypeptides. Antigenic analysis is an important means for differentiation among herpesviruses despite some cross-reactions (eg, between HSV and VZV). Susceptible tissue cultures vary significantly for the individual agents. HSV has the widest range; it replicates in numerous animal and human host cells. VZV is best grown in cells of human origin, although some laboratory-adapted strains can grow in primate cell lines. Human CMV replicates well only in human diploid fibroblast cell lines. EBV does not replicate in most commonly used cell culture systems but can be grown in continuous human or primate lymphoblastoid cell cultures. Human herpesvirus type 6 grows in lymphocyte cell cultures. Characteristically, all of these agents produce an initial infection followed by a period of latent infection in which the genome of the virus is present in the cell, but infectious virus is not recovered. Reactivation of virus may then result in the first episode of clinically apparent disease or as recurrent disease. Complex host-virus interactions determine the expression of disease. With all of these agents, immunocompromised patients, especially those with altered cellular immunity, have more frequent and severe episodes, including clinically severe disease from reactivation of virus. Isolation of human herpesvirus type 7 (HHV-7) was first reported in 1990. The virus was isolated from activated CD4+ T lymphocytes of a healthy individual. 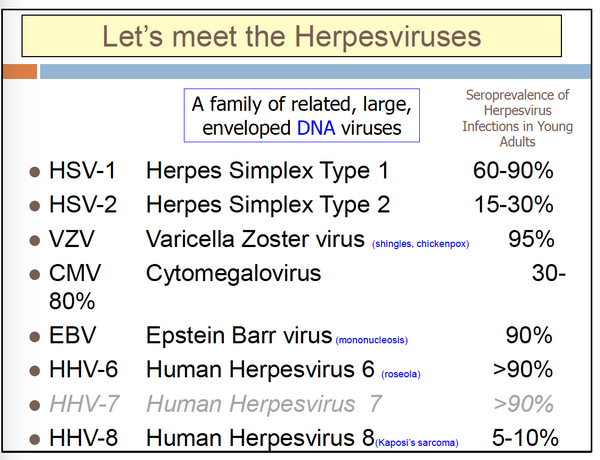 HHV-7 is distinct from all other known human herpesviruses but is most closely related to HHV-6. Seroepidemiologic studies indicate that this virus usually does not infect children until after infancy, and ~ 50% of infants are antibody positive by 2-4 years of age. As with HHV-6 this virus is frequently isolated from saliva, and close personal contact is the probable means of transmission. Also like HHV-6 this virus appears to be a cause of exanthem subitum. The diagnosis of acute infection can be made by the demonstration of seroconversion. No treatment has been identified. KSHV was discovered in 1994 by identification of unique viral DNA sequences in an AIDS patient's Kaposi's sarcoma (KS) tissue. The method used was representational difference analysis. Specific HHV-8 DNA sequences are found in the great majority of KS tissues in the United States, including those from non-AIDS cases, and occasionally in other specimens including lymphomas. Recently the virus was isolated in culture and, when characterized, seemed most closely related to EBV. Serologic and virologic data suggest that this virus is at least a cofactor in the pathogenesis of KS. If at all possible, patients with varicella or disseminated zoster should not be admitted to hospital; if unavoidable, these patients should be in strict isolation. Preemptive ganciclovir diminishes CMV disease in seropositive AIDS patients. Prophylactic ganciclovir or valacyclovir diminshes CMV disease in seropositive or mismatched transplant recipients. Preemptive ganciclovir disminshes CMV disease in seropositive or mismatched transplant recipients.